When you have achieved your cooking milestone in making Mutton Soup, Indian Mutton Meatball Soup & Mutton Parathal, the next higher cooking step must be? Mutton Dalca. Yesss! Mutton Dalca. How do we make Mutton Dalca? Fear not what not ladies and gentlemen. Trust me and trust this recipe of mine, and you we do super fine. 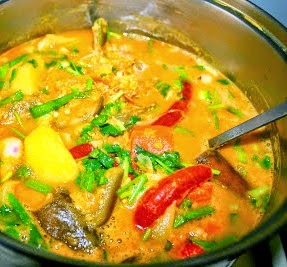 Super fine in making a pot of mouthwatering delicious Mutton Dalca. What is mutton dalca by the way? Mutton dalca is basically mutton in an Indian style dal curry (Spinach Sambar) and like I have already told you, an absolute deliciousness. Add mutton, dhal, ginger, garlic, onion and turmeric powder in a pot. Add enough water and simmer. Once simmered to soften mutton as well as dhal, add curry powder and spices (coriander, cumin and fennel powder). Also add potatoes, carrots, brinjals and red chillies. Stir and continue to simmer to soften veggies. Add yogurt and give a good stir. Off the heat and combine in coriander leaves and spring onion leaves. What a delicious mutton curry!